Raman spectroscopy is a standard tool for the characterization and study of the physical properties of carbon-based materials. In its natural state, solid carbon exists in different structural solid forms (diamond and graphite), which exhibit vastly different physical and mechanical properties. Researchers in the fields of chemistry, physics, and material science are tailoring carbon in the form of fullerenes and nanotubes in order to optimize their properties. 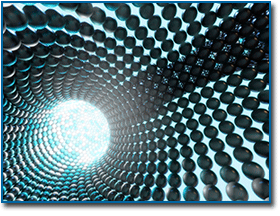 Fullerenes and nanotubes generate a complex spectrum when examined by Raman spectroscopy. The spectrum yields information on both intra- and inter-molecular vibrational modes of the carbon molecules. Information regarding the size, both length and radial, can be inferred from the spectrum. Incorporation of dopants into the host structure affects the properties of the host and these modifications can also be observed in the spectrum. Raman spectroscopy can be used in the laboratory during the research phase, or as a quality control tool during manufacturing. Contact a Kaiser Expert to discuss your applications needs.